Ming-Chi Kuo appears to be back on the Apple beat, with new estimates for price ranges across the three phones said to be in the 2018 iPhone lineup. Kuo, now working for TF International Securities, believes that Apple will move to a slightly more aggressive pricing plan for the new iPhones. For starters, he believes that the 6.1-inch LCD phone will be priced around $600 to $700. Moving up the product line, he also claims that the that the 5.8-inch OLED model will be around $800 to $900 and the 6.5-inch OLED "iPhone X Plus" will be priced around $900 to $1000. Kuo also believes that all three models will ship in quantity in September and early October. This stands in contrast to a report claiming that the 6.1-inch model will be pushed to November because of difficulties cutting an iPhone X-like "notch" out of a LCD panel. Reasons cited for the pricing are customer resistance to the escalation in smartphone pricing, an "improved cost structure" for Apple because of component yield increases, and Apple's hard push of Face ID to consumers which in turn will grow Apple services revenue. Kuo left KGI securities in April, and was expected to stop reporting on Apple's product plans. At KGI, Kuo used his supply chain connections to discern product details that were often accurate, then share his investor memos with AppleInsider and other publications. In 2014, for example, he correctly predicted some specifications of the iPhone 6 and iPhone 6 Plus, as well as the announcement of the Apple Watch, though its launch would only happen in 2015. 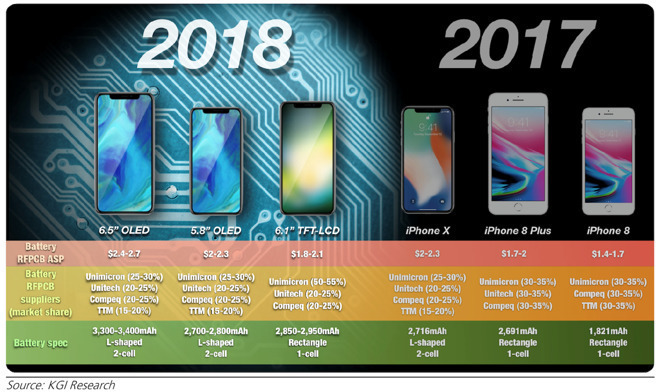 Kuo's last Apple prediction was on April 26, suggesting that this fall's rumored 6.1-inch LCD iPhone will adopt new touch technology and might forego 3D Touch to keep prices down. The analyst was the first to predict that Apple will ship the 6.1-inch LCD device at the lower end, as well as 5.8- and 6.5-inch OLED models. He has also predicted a cheaper HomePod, and a redesigned Watch with a bigger screen, better battery life, and more health monitoring upgrades.